Amazing Grace piano sheet music is not hard to find, unless you're looking for something that isn't in the key of G, something that doesn't have boring chords, or something that DOES HAVE a BIG sound for playing along with a crowd in a big room! This Amazing Grace sheet music page has just such a big arrangement, and a more delicate sounding high arrangement to play as a contrast. Arrangement number one requires a familiarity with chord clusters in the right hand, and extended broken chords in the left hand. That's where those chord inversion exercises pay off for your students! The melody is set an octave up from the first arrangement. If played one after the other (such as for a prelude or as the offertory) the two arrangements make a nice contrast. This version is also considerably easier than the first one. Notice the word "loco" at the end of this arrangement? I like to tell my students that the word "loco" means "LOCATION - back at the location where it is actually written, instead of 8va." The truth about the Amazing Grace piano chords? Just like most easy chords songs, you can get by with the I, IV, & V chords. You will frequently hear the minor VI chord added - lovely - and if you're VERY lucky, the V of the V. So what do I mean? I = G, ii = Am, iii = Bm, IV = C, V = D (or D7, since the V7 chord is used for that special "take-me-back-home-to-the-I-chord" sound), vi = Em, and vii = nothing (it's just the top half of the V7 chord). The V chord of the V chord's key comes from outside the key of G. We shift, momentarily, into the key of D, and sneak its V chord into the music (it is an A or A7 chord), for a fresh sound and the feeling of being solidly "in D."
If you're unfamiliar with basic piano chords, see my free piano chord chart or my pages showing the 12 major and minor keys. The piano chords chart and the major and minor keys pages show you what the chords look like on the staffs, and what their relationships to other chords are. 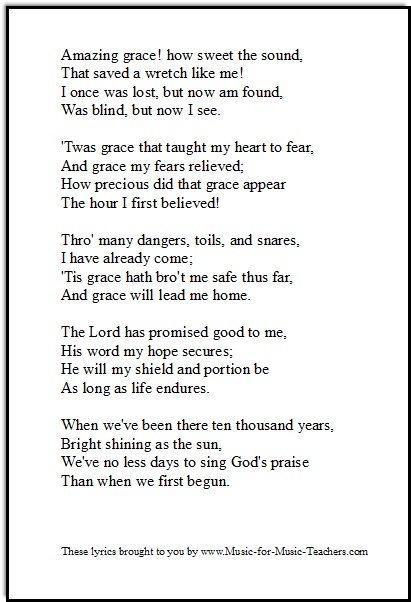 The lyrics to Amazing Grace have been added to over the years... below is a PDF of the most common Amazing Grace hymn lyrics, handy for passing out. 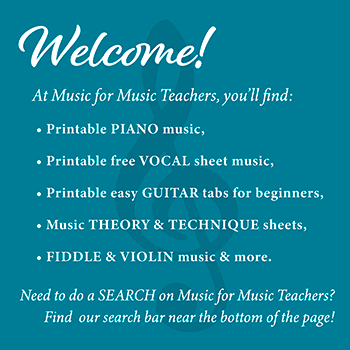 Go here for easy piano sheet music to Amazing Grace, and here for other easy music downloads. And see this page if you're after Amazing Grace guitar tabs.